Change of Place Garden Level is a gorgeous property where you can enjoy the pace of Savannah. This renovated garden property is one of the best Savannah vacation homes due to its location right near famous Forsyth Park. Anyone who has ever spent time in this charming city knows that Forsyth Park is Savannah. Change of Place Garden Level offers 800 square feet of living space. It contains one bedroom and one bathroom. The setup is ideal for up to four guests. This lovely garden property has been completely renovated to offer a fresh look and tons of comfort. It features central air and heat. Of course, the classic charm of Savannah has been retained in both big and small details. It's time to take a look inside one of the vacation rentals Savannah GA visitors should not overlook if they want to be near many of the top attractions in the city. You will find quaint beauty when you step inside this property. The charming living room inside Change of Place Garden Level features brick walls and a fireplace that makes the atmosphere feel beyond cozy. Touches like wood floors, a plush sofa and sophisticated furniture make this room very inviting. There is also a flat-screen television for your viewing pleasure in the living room. This garden property offers a modern kitchen equipped with everything you'll need to prepare meals and snacks during your stay. You'll find a refrigerator, oven, microwave, dishwasher and tons of counter space. In addition, the cherry cabinets inside this kitchen provide ample storage space. The home comes with a dining table with room for two. 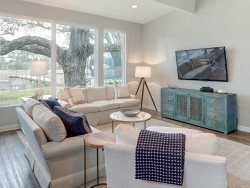 It's easy to see why all of these features make this property one of the vacation rentals Savannah GA visitors love to call home for a while. You'll love how comfortable and cozy the king bedroom inside this property is once you step inside. A large golden bed, dresser and bedside tables give this room a very sophisticated vibe. You can relax in bed while watching the flat-screen television inside your room. Visitors can also make use of the pullout bed located in the living room. The property's bathroom is located directly off of the living room. It features new fixtures. You'll also find a laundry area with a washer and dryer. Both of the flat-screen televisions inside Change of Place Garden Level come with cable television and high-definition channels. There is also Wi-Fi access. Guests who stay at this home get to enjoy off-street parking for one vehicle. There’s also additional parking available on the street. You'll find that this petite property is one of the best Savannah vacation rentals for couples, single travelers or small groups. It is a property that is perfect for guests who enjoy charming, efficient apartments. There is always something fun to do when you're staying at one of the vacation rentals Savannah GA visitors can use to be near some of the best attractions in the city. You will be able to walk to Forsyth Park every day of your holiday when you stay at this centrally located home. That means morning strolls with coffee in your hand or late-evening jaunts with memories of a fun-filled day of sightseeing in your mind. What are some of the must-see things you have to visit when staying in Savannah? The Savannah Historic District is full of architectural pearls and fun attractions. This will be right in your neighborhood if you're staying at Change of Place Garden Level. You can enjoy beautiful homes, visions of moss climbing along the sidewalks and free trolley service when you tour this area. In addition, attractions like the Sorrel Weed House, Bonaventure Cemetery, the Cathedral of St. John the Baptist, Lafayette Square, Old Fort Jackson, Skidaway Island State Park and the childhood home of Flannery O'Connor will all be close by. Making your way down to River Street for great music, great food and some fanfare is also essential when planning a Savannah holiday. The city also hosts many after-dark tours that take visitors through spooky and legendary spots. People staying at Savannah vacation rentals also like to take excursions to Tybee Island to see the lighthouse or visit with dolphins. One of the big reasons why people book Savannah vacation homes is to attend some of the many festivals that take place in the city. In fact, visitors can look forward to amazing festivals and events all year long. Some of the highlights that occur throughout the year include the Savannah Jazz Festival, the Pin Point Seafood Festival, Bacon Fest, the River Street Food Festival and the Savannah Music Festival. It's time to put a special twist on your upcoming trip to Savannah by booking a stay at one of the Savannah vacation rentals everybody always loves to stay at. Change of Place Garden Level is a fun, cozy property that has been completely renovated to provide a modern experience in a timeless city. It features all of the practical amenities you need to feel at home. Don't skip this property if you're looking for one of the vacation rentals experienced Savannah GA visitors highly recommend.